After his 5th-round win over Chinese Taipei’s Yitien Chan on Tuesday morning, China’s Ruoran Wang (left, below) must have been eying the 2014 World Amateur Go Championship trophy a bit possessively. 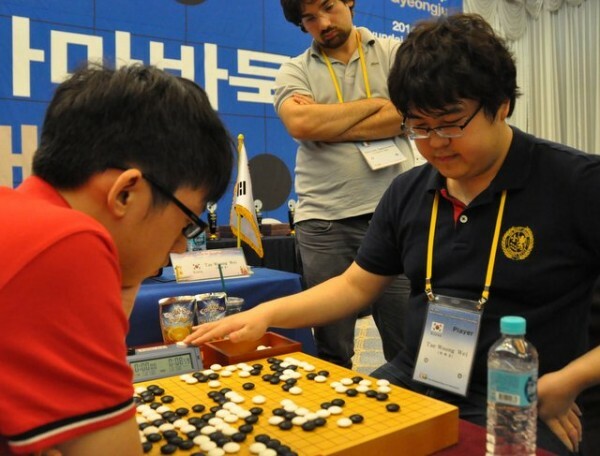 After all, he had just beaten the only other top undefeated player, and heavy favorite Taewoong Wei of Korea (at right) had lost by half a point to Taipei in the 3rd round on Monday. But when the dust settled after the 6th round on Tuesday afternoon, the top trophy was once more up for grabs, with China, Korea and Taipei all holding 5-1 records, though on SOS, Korea looks to have the edge. Meanwhile, the US and Russia, also 5-1, are looking to break back into the top five and Japan, Hong Kong, Thailand, Canada and the Czech Republic are battling it out for a top 10 finish. The final two rounds on Wednesday will settle things; top pairings for Round 7 are Korea-US, China-Russia, Taipei-Thailand and Hong Kong-Canada. Click here for latest results. It was Korean maestro Taewoong Wei who derailed China’s march to the title by snatching victory in his 6th-round game Tuesday afternoon against China’s Ruoran Wang, who had taken the lead just that morning with a win against Taipei (click here for the game record). Wang let out a huge yawn at the start of the afternoon round and the game turned into an early running battle with the Korean collecting points on the right side of the board that in the end proved to be too much (click here for the Korea-China game record). Meanwhile, Jie Liang (US, below right) edged out Yongfei Ge (Canada, below left) by 1.5 points in a North American showdown Tuesday morning that was one of the last games to finish (click here for the game record). Perhaps drained from his hard-fought 4th-round win against Japan on Monday afternoon, Ge fell behind early and Liang was able to maintain his lead into the finish. Liang then drew the Czech Republic’s Lukas Podpera in the 6th-round. Podpera had fought gamely but vainly against Korea in his morning round (click here for the game record) and threw himself into the battle with Liang, winning three fierce ko’s but coming up short in the end and resigning gracefully (click here for the game record). As the tournament wears on the challengers are cranking up the pace, and many games are now reaching their conclusions before the one hour mark. Players are getting more experimental too, with Francis Roads (United Kingdom) taking two 5-4 points and 3-3 sightings coming from the New Zealand and Swiss camps. Dominique Versyck (Belgium) was delighted with his 6th-round defeat of India’s Soni Shah 1D, taking apart a large central group that he allowed he “didn’t need to kill but, well, might as well.” While “perhaps not the politest solution,” Versyck’s victory pushed him to a respectable three wins out of six. Twelve-year-old Nhat Minh Vo (Vietnam) steered his 6th-round game into a huge central battle, culminating with a semeai where it was his stones, and not those of Australian opponent Sang-Dae Hahn, that perished in the fight. 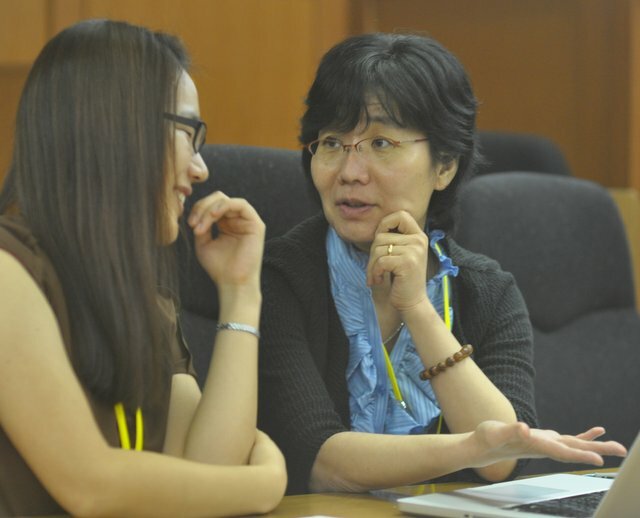 Shigeno Passes the Torch: This year’s WAGC marked the retirement of Yuki Shigeno (at right) from her post as the Secretary General of the International Go Federation (IGF), where she’s served since 2006. Hajin Lee (left) of the KBA is the IGF’s new Secretary General. Shigeno and her husband Ivan Vigano, who edits Ranka, have been longtime friends and supporters of the E-Journal’s WAGC team; we deeply appreciate the many kindnesses she’s shown us over the years and wish her the very best as she continues her work promoting go at the Nihon Kiin. Click here for Ranka’s complete report. - Game reports by John Richardson, game records by Chris Garlock, photos by John Pinkerton and coordination by Ivan Vigano. Click here for Ranka’s complete reports and here for complete results. Matches are broadcast live each round on WBaduk.